Fly into San Diego Airport! No international flights needed. Only 7 spaces remain on this retreat. We’re planning an intimate and beautiful retreat, so it will sell out quickly! These three words describe the goal of Sol Medicine retreats. We use sacred pant medicines to heal past traumas, unveil creativity and inspire gratitude. Sound bowl vibrations, magical meditations, free-flowing dance and a judgement-free community surround our work. Take a safe, secure adventure into the most mystical area of the universe: your inner self! 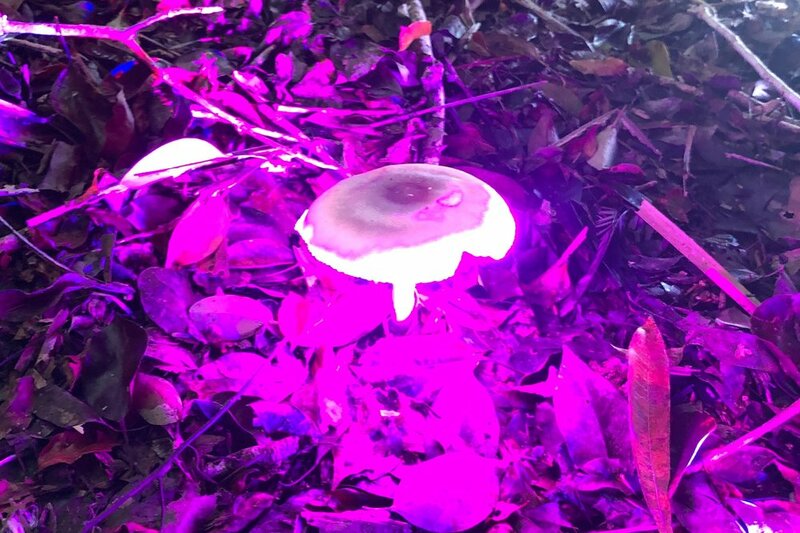 Though many of us have tried "magic mushrooms" as young adults in a recreational or party setting, the healing effects of fungi are finally being discovered, studied and shown to the public. These ancient fungi have a lot more to offer than just a simple good time. Those looking to heal chronic depression, anxiety, social awkwardness, PTSD or even simply a lack of purpose in their lives are sure to benefit from a safe session with psilocybin mushrooms. When done at the correct dosage and under the care and supervision of experienced, caring facilitators, these little magic fungi can help us get to the root of our issues and find the strength to heal ourselves. Possibly even more important than the mushrooms themselves is the preparation, integration and sense of community that will be provided at Sol Medicine. You'll have the opportunity to learn from those around you and receive counsel from our dedicated leaders. Be sure to bask in the glory of unspoiled nature and remember what its like to live a life of happiness and gratitude. Nestled on a peninsula off the Pacific Coast of Northern Baja, our spacious 5600 square foot resort boasts 6 bedrooms, 6 bathrooms, and a variety of beautiful indoor and outdoor spaces suited to help you relax, unwind and enjoy the beautiful Mexican Coast. 6days/5 nights in a safe, private luxury resort near Ensenada Northern Baja, Mexico . 3 Powerful & Legal Mushroom ceremonies lead by trained, musically gifted Shaman as well as loving facilitators. 7 Day Online “Preparing for the Psychedelic Journey” Course eases your mind and sets intention. Transportation to and from the San Diego (SAN) airport. No international flights needed! Optional snacks, food or souvenirs outside of the home. Extra days/nights in the area or transport outside the SAN airport. I'm so ready to go! Only room for 8 more guests! Transportation from San Diego (SAN Airport), Luxury accommodations, 3 guided ceremonies, meditation, integration, workshops, meals, and snacks all included. Amanda's goal as a Psychedelic Leader & Guide is to protect the practice of Native American Spiritual traditions, ceremonies, and sacred practices. As an advocate of the safe use of psychedelics, she strongly supports not only the continued scientific research into their potential, but also the use of the traditions surrounding their ancient healing. Amanda has spent the past 4 years studying native plant medicine and ceremonial healing with over 500 guests in Ecuador, Mexico, Jamaica and around the world. During her stay as a manager and facilitator at Gaia Sagrada, she kept the sacred fire, taught holistic health workshops and meditation. Her position included managing and leading a group of 15 volunteers at the center. She is the founder of The Buena Vida Psychedelic Retreats & Sol Medicine Mexico. She works with private groups and retreat centers around the world. Her podcast, Semi-Woo, is a celebration of all things spirituality, consciousness and "woo-woo"! She splits her time between her home in Seattle, WA & Mexico. Shamanic Musician, Oracle & Healer; Ceremony Leader Kate is a certified Sound Healer, 200Ryt Vinyasa teacher, Reiki attuned and shamanic initiate of Peruvian Shipibo tribe plant healing. She shares her practice, plant spirit medicine meditations, sound healing events and self care healing retreats in Seattle, Washington and around the world. "I am Kate Ryan; Songbird, Oracle & Shamanic Musician. My Maternal Grandmothers maiden name was Jakku. Throughout my life I have been called to heal with a relationship to the great divine feminine. I believe when we heal ourselves, we heal our family & ancestors. I carry the lineage of strong women forward to build a legacy of love. A graduate with a BFA in Theater, my 20 years of performance work focused on Ritual, trance practice & social engagement. I am currently sharing my practice through classes, workshops & self-care healing retreats based in Seattle, Washington." Welcome To The Buena Vida! Day 2: Ceremony #1- "We Welcome the Fungi Teachers"
Day 3: Ceremony #2- "Time to go Deep"
Evening bonfire with new friends! Day 5: Ceremony #3-"Mother Nature is Our Teacher"
Shuttle to Airport between 8am-1pm depending on timing of flights. At The Buena Vida, we admire those willing to go through the process of self-healing with psychedelics. We’re sure that' you’ve already had quite a serious journey that leads you to this decision. We want to make you feel safe, secure, and well supported during your retreat. Below are some of the most commonly asked questions and concerns that we hear. However, there are always more! Contact us with any concern and we will be sure to respond personally and in private. We understand there is a lot of good and bad information about traveling in Mexico. Please remember, this is a very large country and, like almost any other, has some safe and some not-so-safe areas. As of April, 2006 all street drugs are legal to be carried in small quantities by individuals in Mexico. Specifically, sacramental or traditional use and cultivation of fresh mushrooms is legal. This is in line with the interpretation of the UNODC Bulletin allowing the sacramental use of psychotropic preparations. We work with a local, indigenous shaman who is familiar with the local laws, law enforcement and medicine community ensuring that we are always acting in accordance with the highest standard of the law. Our retreat is on private, gated and secure land. We will not be interacting with the public or carrying the mushrooms on our person while outside the center. We are working with open-minded, loving individuals and volunteers that are dedicated to healing and health. You can feel 100% confident that our medicine is the freshest and energetically peaceful fungi that our shaman can find. We only source from Mexico. I’ve been hearing a lot about healing mushrooms, but I’m honestly not sure what they do? The active ingredient in “magic mushrooms” is a non-toxic element. Though you may have heard that your reaction to mushrooms is a form of poisoning, much like alcohol, this is simply not true. This chemical interacts with your serotonin system to produce the psychedelic effect. In fact, it is one of the least toxic substances you can ingest that will change your consciousness. It has been shown over and over that they promote neurogenesis, the growth of new brain cells and can repair physiological damage to the brain. Because mushrooms are somewhat easy to grow and find, many of us have tried them either at a young age or at a party or festival. These fungi open up our energetic field so that all circumstances around us are amplified. Most truly "bad trips" stem from a ill-planned physical setting or a non- purposeful mindset going into the journey. At The Sol Medicine Retreats we know how to properly prepare you and make sure your physical and energetic space is properly held, ensuring you the best possible container for a meaningful and safe trip. While there may still be difficult parts of the journey, when you know you're safe, you can navigate through these areas and take the lessons from the experience. Even guests who may report that part of their journey was “difficult” usually can see the purpose or reason for this situation within the first few days after the trip. I’m dealing with depression and anxiety. This scares me, but I’ve also heard it can help? We are lucky to be living in a time where the healing effects of psychedelics are finally allowed to be properly studied. Scientists from Imperial College London concluded that giving managed doses of mushrooms to subjects who were previously resistant to treatment by common anti-depressants led to “enduring reductions in symptom severity”. As is commonly known, much of depression stems from living in the past and much of anxiety stems from living in the future. Mushrooms help us to become fully present. We're able to observe the world and ourselves exactly as they are at this moment. The result is usually a more care-free and open attitude toward our lives. We can stop for a moment to learn gratitude for our many blessings. What if I suffer from severe mental issues? There are a few serious mental issues that need to be disclosed before taking these medicines. Those with a history of schizophrenia, suicidal behavior and some other mental states are advised against psychedelics use without a specific recommendation from their medical doctor. However, physical risk is extremely low. Please be honest in your application so that we can have full knowledge to let you know if our retreats are the right medicine for your healing. We can answer these specific questions in a private email. What is the dose we will be taking? This is an interesting question because age/height/weight seem to have almost no effect on proper dosing. Since potency of mushrooms can vary widely from each batch, it is best to dry, mix and encapsulate them in order to make equal doses. Our leaders are always testing and dosing our mushrooms to be sure of their strength For the first ceremony, we will be dosing about 2-3 grams per person. We will counsel with guests to see where they'd like to be after that. Luckily with these fungi, there is not much nausea other than possibly 10-20 minutes towards the beginning and even high doses are very safe with the right facilitators. Where can I read more about scientific studies being done? There are too many studies and scientific findings to list here. Please visit our Psychedelic Research page. All of the studies basically have the same conclusion: These plants are safe and highly effective when taken correctly and with proper safety.